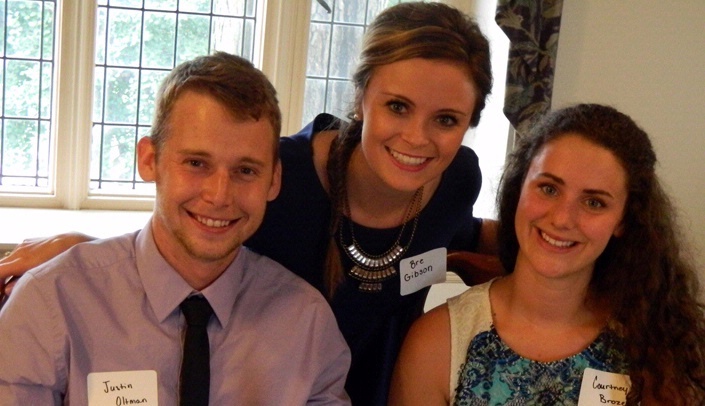 Medical student Justin Oltman, left, poses with Breanna Gibson, center, and Courtney Brozek at the Medical Student Reception held earlier this month. More than 90 medical students and guests attended the Medical Student, Spouse/Significant Other Reception at the UNMC Alumni House on Aug. 17. It was the second year for the event, which is hosted by the College of Medicine Parents & Family Association (PFA). The purpose of the event is to provide opportunities for the spouses and significant others of medical students to meet and create a sense of community during medical school. This event gave students the opportunity to socialize with College of Medicine Dean Brad Britigan, M.D., and his wife Denise Britigan, Ph.D., as well as members of the College of Medicine Alumni Board and the Medicine Parents and Family Board. The event, which was created by the UNMC alumni student representatives and College of Medicine class officers in 2014, has been well-received and will be an annual affair. In August, the Fred & Pamela Buffett Cancer Center received two generous donations that will benefit brain and lung cancer research at the new facility. An Ice Cream Cruise, held Aug. 1 and 2, raised $14,669 for the Brain Cancer Research Fund. The money will help oncologists such as Nicole Shonka, M.D., and Michelle Aizenberg, M.D., advance patient therapies, while finding more effective ways of detecting and diagnosing malignancies in the brain. On Aug. 7, the second annual Fairways Fore Airways Golf Scramble was held at Tiburon Golf Club in Omaha. Tim and Leah Bochnicek organized the event, which raised $15,000 for lung cancer research. In December 2013, Leah was diagnosed with stage 4 lung cancer. She's a patient of Nebraska Medicine oncologist Alissa Marr, M.D., who was the keynote speaker at the golf tournament. The family plans to host a dance at Sokol Auditorium on Nov. 1, with the proceeds also benefiting lung cancer research at the Fred & Pamela Buffett Cancer Center. More details will be provided when the event is finalized. Tammy Kielian, Ph.D., professor of pathology and microbiology, who took on the search for a treatment for Juvenile Batten disease (JBD; CLN3) when her niece, Olivia, was diagnosed with the rare, fatal disorder, has received funding support from a fellow family also fighting the disease. Dr. Kielian's research was recently awarded a $50,000 grant from the Batten Disease Support and Research Association and Drew's Hope. Drew's Hope is named for Drew Ferrandino, a Pennsylvania boy who died last year, at age 12, of the late infantile (CLN2) form of Batten disease. His foundation continues to raise funds for Batten research. This grant, written with Venkata Kakulavarapu, Ph.D., a senior scientist in the Kielian lab, will be used to study how neurons in the brain lose vital trophic support, leading to their death in JBD. Dr. Kielian, with UNeMed, the technology transfer and commercialization office for UNMC, also recently entered into a licensing agreement with a biopharmaceutical company to further develop a gene therapy approach discovered in her laboratory that holds promise as a potential therapeutic for Juvenile Batten disease. Wayne Stuberg, Ph.D., associate director of the Munroe-Meyer Institute and director of the Nebraska University Center for Excellence in Developmental Disabilities, will take part in a panel discussion on legislative, medicaid and medicare, education, and employment issues for people with special needs at the Omaha Public Schools' Teacher Administrative Center, 3215 Cuming St., at 5 p.m. on Sept. 30. Dr. Stuberg will be joined by Yolanda Webb, director of the Nebraska Department of Health and Human Services' division of developmental disabilities. Refreshments will be served at the event. Joseph Evans, Ph.D., associate clinical director of the Behavioral Health Education Center of Nebraska and director of psychology at the Munroe-Meyer Institute, has been appointed to serve on the prestigious National Advisory Committee on Interdisciplinary, Community-Based Linkages. He will represent the field of psychology and behavioral health as part of this interprofessional committee. The committee was created by Congress to provide advice and recommendations to various governmental entities, including the secretary of the Department of Health and Human Services.